My new green obsession has little to do with the environmentally-minded trends that have become so popular in recent months. Until a few days ago, I've always preferred the red salsas over the green ones. But something happened and now I can't get enough salsa verde. So I made a giant batch of it yesterday, using a recipe supposedly attributed to Rick Bayless (I don't recall where I found it). 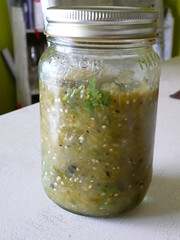 If you are a little less DIY-inclined, my two favorites for the tomatillo-based salsa verdes are Chef Earl's Salsa Verde and Frontera's Tomatillo Salsa. Start by roasting 1 pound (20-25) of tomatillos (cleaned and husks removed) and 12-15 serrano peppers (stems removed) on a baking sheet lined with aluminum foil in the broiler, for about 5-7 minutes on each side. You can easily find tomatillos and serranos in any Mexican grocery. While those guys are roasting, cut a medium white onion into 1/4 inch thick rings and peel 6 cloves of garlic. Place on another baking sheet. When the tomatillos and peppers are finished, set them aside to cool, lower the temperature of the oven to 425 degrees and begin roasting the onions and garlic. Stir them occasionally and cook until some of the onions are charred and they look translucent. It will take approximately 15 minutes. Go and do something else for an hour or so while all this roasty goodness cools. Combine the serranos, onions and garlic in a food processor (or blender) and process. Remove to a bowl. Place the tomatillos in the same processor or blender and pulse until all the tomatillos are broken up. Add up to 1 cup of water to thin the mixture to your liking. Combine the tomatillos in the bowl with the serrano, onion and garlic mixture, add 2/3 cup of chopped cilantro and season with salt and sugar. Enjoy with chips, on tacos or straight (by the spoonful). Muy Rico! How much does this recipe make? Is that a 1 quart mason jar's worth in the photo or a smaller amount? Can't wait to try to make this one. Oops. I should have written that. No, it makes more than a mason jar's worth. It makes about 2.5 - 3 quarts! I told you I made a giant batch! I think I'll try this recipe this weekend! Also, a cup of that Frontera tomatillo salsa and three mashed avocados makes an excellent quick guacamole.